FWC scientist Stephanie Schopmeyer carefully chisels an elliptical star coral off a reef in the Lower Keys. 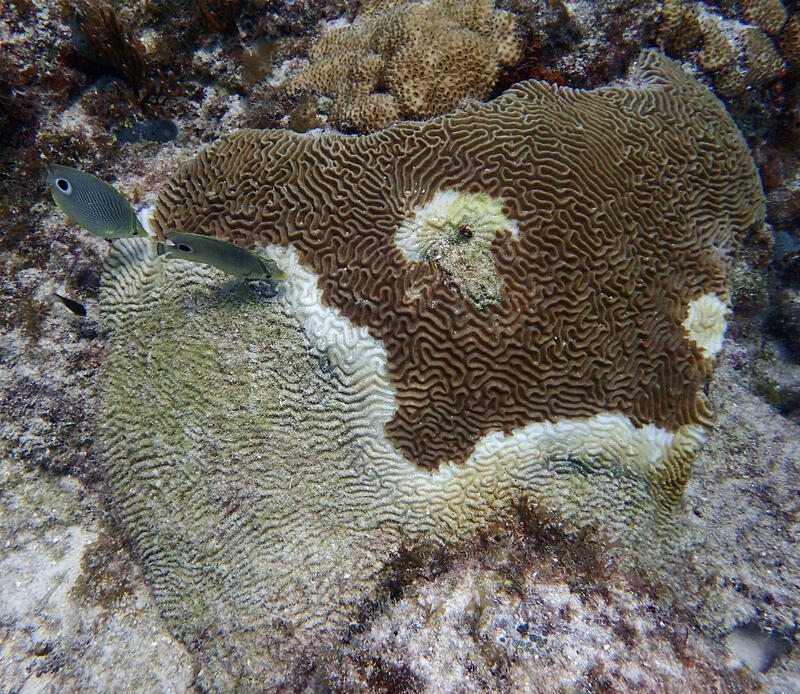 An elliptical star coral is chiseled off the reef, part of the coral rescue project. Allan Anderson, left, and Nate Berkebile look after the corals while they're at Long Key Marine Lab. The corals are labeled by species and location where they were collected, before being sent to labs and aquaria around the country. Scientists are so worried about the effects of stony coral tissue loss disease that they are launching a coral rescue project to save some in captivity. Five years ago, a new coral disease was found right off downtown Miami. It has now spread through the Florida reef tract, from Martin County down past Key West. In response, scientists are taking unprecedented measures to make sure some coral survives, at least in captivity. Biologists who study coral reefs spend a lot of time underwater, checking on the health of corals. They watch the progress of coral bleaching and diseases, and hope for recovery. 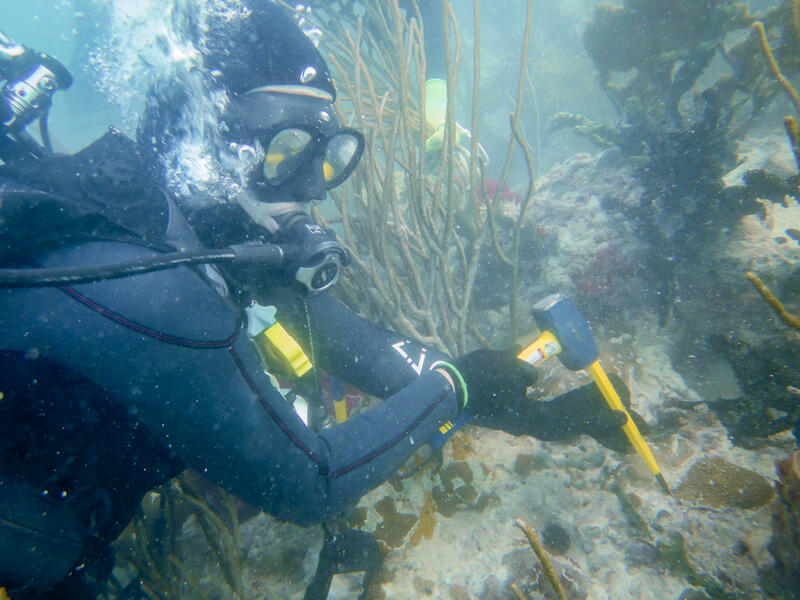 But right now in the Florida Keys, some biologists are taking chisels into the water to remove colonies of coral. "It hurts, yeah," said Nate Berkebile, a biologist with the Florida Fish and Wildlife Conservation Commission. "But it also feels good. Because now we know that we're trying to save the reef as much as we can." Berkebile is on the front lines of the Coral Rescue project. He's helping to collect thousands of individual coral colonies that are in the path of stony coral tissue loss disease and in danger of being wiped out. The disease affects the hard corals like brain and star coral — literally the foundation of the reef. The reefs in Florida have been getting hit with diseases for decades. But state biologist Rob Ruzicka says this disease is on a whole different level. "When the disease passes through an area, those species of corals, we're losing 95 percent of them," said Ruzicka, one of the leaders of the Coral Rescue project. With such a high mortality rate, the scientists were watching the reefs disappear. And unlike with coral bleaching, there wasn't even a partial recovery. "It literally was equivalent to a forest fire," Ruzicka said. The scientists started thinking about the rescue project last year, after the disease jumped the gap between the Middle and Lower Keys. That's the span crossed by the Seven Mile Bridge. About a year ago, it showed up at one of the most iconic reefs in the Keys. "Once it reached Looe Key was a real turning point," Ruzicka said. The scientists started talking about collecting the coral that was still healthy, and doing it on a scale that's never been attempted anywhere in the world. "It was really the only way to guarantee that there would be some survivors left," he said. They're having to move fast. Early this year, the disease reached the reefs off Key West. So they have to collect ahead of the disease line, in areas like the Marquesas and the Tortugas. The coral will wind up at labs and aquariums around the state of Florida, like Mote Marine, the Frost Science Museum and the Florida Aquarium. It's also being shipped out to New Jersey, Iowa and Texas. But the first stop on land is at the the Keys Marine Lab on Long Key. The marine lab is where Berkebile and Allan Anderson make sure the coral stay healthy. "My position is actually titled Coral Caretaker," said Anderson, who just graduated with a master's degree from Nova Southeastern University. He feeds the coral, cleans the tanks and makes sure the water is clean and at the right temperature. And he also has to make sure the corals get along. They can resemble rocks or plants but corals are animals. "Some species are way more high maintenance than others," Anderson said. Ruzicka said collecting all this coral so quickly means the researchers are learning a lot they didn't know from monitoring them on the reef for decades. "We're learning which corals are finicky in an aquarium. Some corals, they're just not good neighbors to one another," Ruzicka said. "Some individuals will take their tentacle and actually slap the other individual." Slapping isn't the only sign of a cranky coral. Some of them turn pale and lose their color when they're stressed out, like in coral bleaching. Besides making sure some corals survive the disease, the project's other aim is to breed them in captivity. So that eventually, if the disease burns out, new baby corals can be transplanted to repopulate the reef. Ruzicka says with all the challenges facing corals, a rescue plan to preserve a gene bank was overdue. "By trade, we're scientists. We're used to measuring things, documenting how they're doing," he said. "But the actual removal process, and then putting them into captivity and then driving these corals around the state of Florida is all very new to us." Even though the project is focused now on collecting healthy corals while they can, they recently got a head start on the next step. Some of the rescued corals at the Florida Aquarium in Apollo Beach have already started to reproduce.